Polling evidence suggests climate change has the potential to be a more important factor in this election than in any previous vote. As the election rushes closer, climate change appears to be fading as a party political issue, but the polling evidence suggests it has the potential to be a more important factor in this election than in any previous vote. The polls suggest the Liberal Democrats rely on climate change being an electoral issue, and the Conservatives will struggle to find a position on climate change that allows them to win seats at the same time as sustaining the party’s support for the leadership. For Labour, making climate change an electoral issue and a Labour strength has the potential to help the party at the expense of both main rivals. Despite the recent wave of stories about supposedly dubious practices in climate science, there is little strong rejection among the public that climate change is a reality. More than 90 per cent think it is happening at least to some extent, with the strength in belief having fallen only slightly in the last few months, and may well recover as memories of the cold winter fade. Not only is climate change largely unchallenged as reality, it is also seen to be important and requiring action. In December, a YouGov/Left Foot Forward poll found that 1 in 5 see it as among the three or four most important issues facing the country, and another poll last year by ICM showed that 6 per cent see the environment as the single issue that will be most important in determining their vote. While 1 in 20 does not sound like much, a 6 per cent swing would be enough for the Tories to win their top 111 target seats, and for the Lib Dems to win their top 43 targets. If just some of that 6 per cent were to vote together, they would be extremely influential in a large number of battleground constituencies. That environmental vote may not appear currently to be favouring any particular party: according to a new ICM poll the three parties are roughly tied on being seen to have the best policies on the environment. However, this disguises two factors that could be critical for influencing the parties’ positions on climate change for the election. Firstly, while on an absolute level the parties are seen to be equal on their environment policies, on a relative level the Lib Dems are doing much better than Labour and the Tories. It is easily the Lib Dems’ strongest area, and is among the weakest for the other parties. This points towards different electoral strategies for each of the main parties. 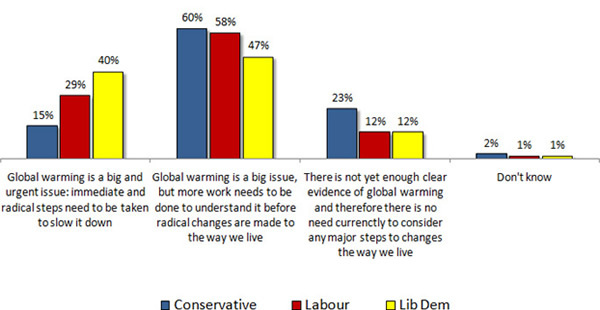 For the Lib Dems, climate change is an issue that appeals to their base, and plays to their strength. As such, there is much to recommend a strategy of increasing its prominence as an electoral issue, with the goal of drawing attention of the climate conscious to the Lib Dems, and potentially increasing the numbers whose vote is determined by the environment. The chief risk in this is that a reputation for caring about the environment softens the party’s image: making it harder to seem credible on tough issues that determine more people’s votes. In comparison, the Tories’ position is much trickier. To form the government, the party has to win support, or at least neutrality, from a large number who voted Lib Dem in 2005. Showing that the environment is safe in Conservative hands would give these voters a strong reason not to oppose a Tory government. But at the same time, the Tory base is often unenthusiastic, and sometimes outright hostile, to policies that tackle climate change. Indeed, even Tory candidates don’t seem very keen on tackling climate change; a poll in January put reducing Britain’s climate footprint as their lowest priority. Thus, Labour’s strategy needs to consider both fronts: the opportunity against the Tories and the threat from the Lib Dems. It would be a mischievous but effective tactic for Labour to force the Tories to talk about climate change during the campaign. Cameron’s line of “Vote blue, go green” provoked resentment that still has not gone away in some sections of the party’s support who are already sympathetic to Ukip. Stories about Cameron having to deal with splits in the party would be unhelpful for the Tories during the campaign. But at the same time, Labour would have to adapt to the Lib Dems in an election where climate change is a more prominent issue. As well as making climate change a stronger electoral issue, Labour needs to do more to convince those who care more about it that Labour’s policies are more effective than those offered by the other parties. Interesting. At the Fabians Spring Conference earlier this year, attendees voted overwhelmingly to back a ‘Green New Deal’ as the ‘best idea to beat the right in 2010’. Other progressive commentators have been pushing for Labour to give greater priority to the green jobs argument, which appears to have been happening since the UK Low Carbon Industrial Strategy was published last summer. It will be interesting to see how far a ‘red-green’ package is offered in the Labour manifesto, which is after all being written by Ed Miliband. I don’t think Labour goes far enough in green policies. We still use GDP as a measure of our economic growth, which does not take into account environmental concerns or poverty. The EU is studying a revised GDP which includes these concerns. Until we use an economic measure that takes account of climate change and particularly poverty we will not achieve stabilization of the climate and eliminate poverty.